Fatehpur Shekhawati, Rajasthan is a small town of the district of Sikar of Shekhawati region. It is a Tehsil office now a days for surrounding villages. As the name suggests Fatehpur was established by Nawab Fateh Khan in year 1451, later the same was conquered by Shekhawat Rajputs. Fatehpur is also called the culture capital of Shekhawati. 1- Dwarkadheesh Mandir (Temple) :- Built by Seth Asharam Ji Poddar in the 19th Century. This building is rich with fresco paintings of Shekhawati. 2- Singhania Haveli (Mansion) :- Built in 3 years span from 1857 to 1860 by Seth Jagan Nath Singhania Ji. The grand mansion is itself a landmark of Fathepur Shekhawati, it is known for the artistic sculpture and fresco paintings of the British Raj. 3- Dau Janti Balaji Dham (Temple) :- It is a famous Lord Hanuman Mandir (Temple) known for miracles and fulfilling wishes of the devotees. 4- Nadine Le Prince Cultural Center :- Nadine Le is a french artist, she purchased the Deora Haveli in year 1999 to transform it in to a cultural center. Nadine is involved in preserving and restoration of old havelis and Fresco paintings and Murals. 5- Other Places :- There is plenty of Havelis made by trader community in the 19th Century, few are like Saraogi Haveli, Goenka Haveli etc. 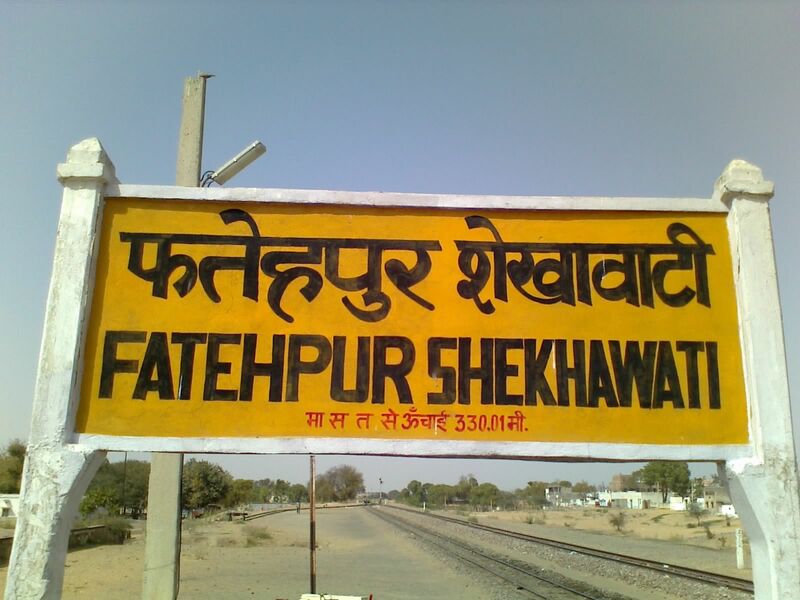 How to reach Fatehpur Shekhawati? 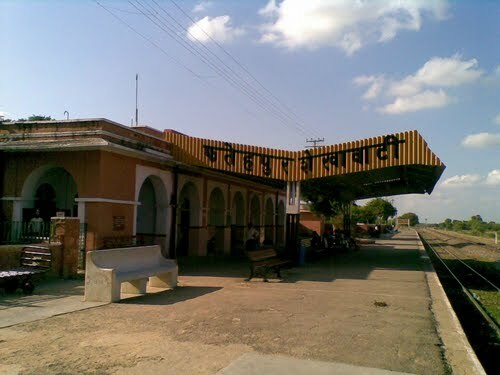 :- Fatehpur is situated on Jaipur-Bikaner Highway NH#11, it is also connected by rail. The Jaipur – Sikar – Churu rail route covers Fatehpur Shekhawati. Fatehpur sekhawati is the place where myself and my dreams comes through…I had my Graduation from the college ie..Seth G.R.Chamaria college in 1971. A sleeping town ..easy going life.Local market and a library ..Saraswati library. another lib..Azad Bhawan Pustkalaya…and I remember my school ..Jangid vaidik vidyalaya ..my father Shree Ramniwas Bhaskar was the Head Master of my school.My school and college days , I always remember.but after 42 years things have totally changed. Every where we looks khandher, mentality of local residents are very poor…Relationship, zero.die for money…JYADA KUCHH NAHI..BURA LAGATA HAI…. Sir People. Changed because of their needs and expectations and you are saying right Havelies and so called SHAAN of our Fatehpur is deteriorating fastly neither politicians nor youth is not understanding their responsibility . the havelis of fatehpur shekhawati are very nice,Ireally miss them…. We should start a group exclusively for fatehpurwasi. Hi all Fatehpurwale friends, I love this city as much as you all do. Because of my love to this city, I did a extensive research work and prepared a pictorial history book “Fatehpur Darpan” Apartfrom this I have just released a book Äjab Deewane” containing short biographical history of certain important people of this city who has done a lot for development and improvement of this city. Pictures are in colour whereas some ancient one in b/w as well. Both the books are must reading for all Fatehpur lovers. You may contact me on my cell: 9821042840. Regards, Nalin Saraf (India). I proud of my culture.. & I proud of my city…so thanks….fatehpur shekhawati…I love u..& salute …..jai shree laxminathji..
Now I am living in Mumbai but my heart always in Fatehpur shekhawati because Fatehpur shekhawati is my birthplace. I like fatehpur shekhawati, because jalalsar is my village about 10 km far from fatehpur. Fatehpur Shaekhawati is a turely mesmarising place. Has relegious sparks and also is a great junction for god and godessess.It is a hub of rajasthani culture and relegious temples. Having Laxminathji temple and Amrithnathji Aashram in it aads a symbolic meaning and importance for thins unique and beautiful place. And this is all because of the wonderful people there and their belief. The 73 years old school near to close..
इस क़स्बे के साथ मेरे बचपन की यादे जुडी है ..मेरी जन्म भूमि होने के साथ ही मेरी शिक्षा दीक्षा भी फतेहपुर शेखावाटी में ही हुयी थी..
क़स्बे के बाहर बालू के ऊँचे ऊँचे टीले, जहाँ शाम के ढलते सूरज को साक्ष्य मान जीवन के सपने संजोये, उन मित्रो के साथ जो मेरे सहपाठी होने के साथ साथ पारिवारिक पडौसी भी थे ..
बचपन की स्कूल जहाँ पंडित हरिकेश दत्त शास्त्री अवं श्री राम निवास भास्कर, जिन्होंने पूरी सिद्दत के साथ इस विद्यालय को प्रारम्भ किया अवं उसे बड़े श्रम के साथ आगे बढाया,नैतिक शिक्षा के साथ संस्कारों वाला यह स्कूल ,जांगिड वैदिक विद्यालय हमेशा स्मरण रहेगा ….आज वर्षो बाद भी मैं जयपुर का निवासी अपने पुराने दिनों को याद कर हर्षित हो जाता हूँ …. . I love my god laxminathji . My native place is also Fatehpur Shekhawati. My father came to Kolkata since 1971. I leaved in Kolkata from born but when I go to Fatehpur I feel that this is my place. I feel so peace. Mera ghar mere ristedaro ne jor jabardasti le liya. Lekin meri bahut iccha ha ki mai Fatehpur me hi ghar bana ke rahu or apne kasbe ke liye kuch upyogi kam karu. Mai education ke liye kam karna chathahu apne kasbe me. I belong to Fatehpur Shekhawati my home is near to punch mukhi balaji ka Mandir, as of now I am running in 55 of my age and my home town is alway come in my memory from childhood to my youth earlier we were at near to jangid vedic vidalya later on shifte to my curent palace.I remmber my those days when i viseted daily to govind dev ji mandir, natho ki bani and playing cricket with my neighbour hoods fellow Bhudev jangid om prakash jangid, As know a days I am working at Delhi and want to return back to my home town altough my children are not allowing me but defenetly I shall come back and enjoy my childhood life. LAGATA KUCHH SAPANE JAISA, KUCHH KAHANI ACCHHI HAI ..
MY GRAND FATHER LATE MAHEO LAL SARAF, BELONG FROM FATEHPURE SHEKHAWATI, I. JAI PRAKASH SARAF HERTIEST LOVE MY FATEHPURE SHEKHAWATI (RAJ), MY VISIT IN TWICE A YEAR,STILE MY OLD HAWELI IS THEIR, I AM PROUD TO BELONG FROM FATEHPURE SHEKHAWATI, AT PRESENT MY FAMILY AT SILIGURI, WEST BENGAL & MUMBAI.